Greetings fans, friends and spambots! Today begins the “52 Weeks Of Ken” project, during which I will release one recording, every week, for 52 weeks. Most will be new songs, some will be new recordings of previously unreleased material, and a few will be covers. Everything will be released under the Creative Commons Attribution-NonCommercial license, which you can read about here. What that means is that you’re free to do anything you want with the recordings except sell them or use them in a commercial context. That means you, Glee. Eventually I will be making stems available for remixing and FLAC downloads for people with really sensitive ears. But enough about what I will be doing. I already have a song for you! 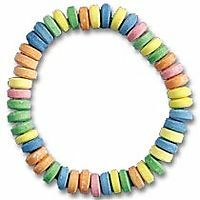 It’s called “Candy Necklace” and is vaguely based on a true story. Enjoy!